One of the world's most powerful heroes, Wonder Woman is an invaluable member of The Justice League of America, and one of Superman's closest friends and allies in crimefighting. It is believed that Superman first encountered Wonder Woman while he and several other heroes fought against the forces of Darkseid. Darkseid, along with DeSaad, Dr. Bedlam, and Glorious Godfrey, tried to discredit Earth's super heroes. The scheme failed, and led to the reorganization of The Justice League of America (Legends miniseries). Because Superman and Wonder Woman share super strength, flying, and membership in the JLA, many speculate that their friendship is a more romantic one. Some have come to the conclusion that Wonder Woman and Superman are lovers. This does not bother either Superman nor Wonder Woman, as they will claim otherwise; but the persistent rumor does irk Lois Lane, who is secretly married to Superman. Understandably, Lois Lane feels intimidated by Wonder Woman's beauty and closeness to Superman. At one stage, both Wonder Woman and Superman were transported to Valhalla, where they assisted Thor and other Asgardians in protecting that realm against demons. The two spent nearly a thousand years in this long war, but proved victorious. Even when thinking they would never return to Earth, Superman resisted urges to be romantically involved with Wonder Woman, stating "Even if she is... gone... a thousand years and another world past... Lois is still the only one." Wonder Woman respected Superman's actions, and the two proved to be true friends (ACT #761). 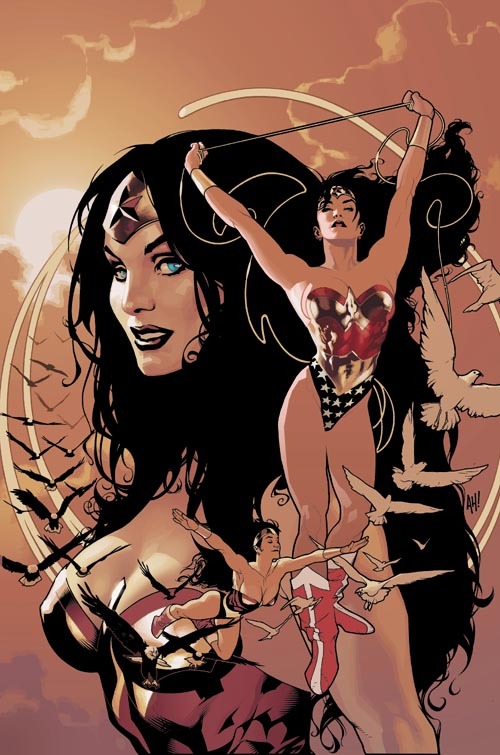 At the conclusion of the Infinite Crisis, it appears that Wonder Woman's persona will now resemble the classic version. Concluding her conversation with Clark Kent, Diana left in her Invisible Plane. There is also evidence that she may resume the Diana Prince alter ego... an essential part of the Wonder Woman mythology. Whether the Amazing Amazon returns to classic form... we shall see.